Tottenham wasted a glorious chance to get back into their FA Cup tie against Crystal Palace. Right on the stroke of halftime, Kieran Trippier sent his penalty wide of the goal. 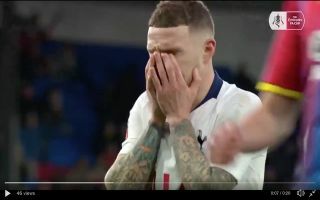 Mauricio Pochettino’s were handed a lifeline when Palace full-back Patrick Van Aanholt recklessly brought down Juan Foyth in the box and football fans would have thought that giving Kieran Trippier a chance from the spot would be as good as gifting Spurs a goal. The former Burnley right-back perfectly echoed Tottenham’s afternoon so far by sending his penalty well wide of the goal, Pochettino’s men have failed to take their chances and they look set to crash out of the cup to Roy Hodgson’s Eagles. This will be a week to forget for the North London club, they certainly have some work to do on penalties when they return to training. This is their second penalty disappointment of the week, after crashing out of the League Cup against Chelsea on Thursday evening. Trippier may have produced the goods for England last summer but he’s now regarded as one Tottenham’s most disappointing players this season. His ability from dead-ball situations would usually be enough to carry him through but his luck seems to have run out today.